You may not think about it, but your health can affect your finances... sometimes in ways you wouldn't expect. There's the immediate cost of unhealthy behaviors, such as buying cigarettes or fast food. Then there are the long-term expenses, such as medical care for preventable diseases. Medications, days off of work, increased health insurance premiums — the added costs are wide and far-reaching. Curious how your lifestyle may be affecting your bank account? Let's take a look at two leading unhealthy habits that cost you money: smoking and poor diet. Smoking is the leading cause of many diseases such as lung, mouth, and throat cancer. Not only is it bad for your health, it's bad for your wallet, too. According to findings summarized by Rutgers University, the net worth of a typical non-smoker was found to be twice that of a typical heavy smoker. Light smokers fare slightly better, typically having a net worth of about 50% less than their non-smoking counterparts. One explanation for the gap in the net worth of smokers versus non-smokers is that smokers will ultimately have more expensive, and more frequent, medical expenses due to their smoking habit. The ongoing (and high) cost of cigarettes also sets smokers further back financially, compared to non-smokers. Employers are increasingly adopting health promotion policies to improve the health of their workforce. For example, some employers require employees who identify as smokers to pay higher health insurance premiums. 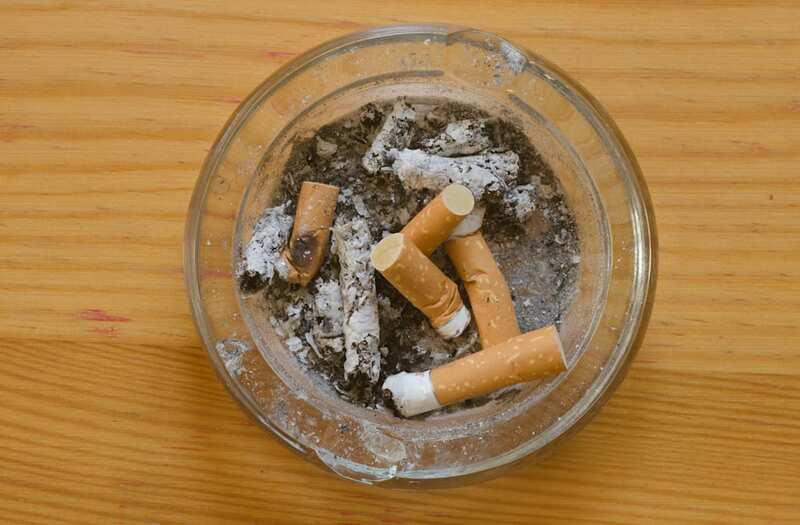 Other employers have smoke-free workplace policies that prohibit smoking on their premises altogether. In states without smoker-protection laws, it's within an employer's legal right to not hire a smoker or fire an employee for violating the smoke-free workplace policy. Quitting smoking can save you up to $70 per week (at $10 per daily cigarette pack). This equates to over $3,500 in yearly savings. Think about what you could do with that much extra cash! Would you establish a solid emergency fund? Fund your IRA? Perhaps, you'd finally take your family on that exciting vacation you've always wanted. An extra three or four thousand dollars each year could go a long way for many folks. Saving on the cost of cigarettes is just the tip of the iceberg when it comes to the benefits of quitting smoking, too. You'll improve your overall health and decrease your likelihood of developing certain cancers, which are costly diseases to treat. There's a reason that personal finance gurus often advise that you trim the "eating out" expenses first, when looking to whittle the expenses: fast food and restaurant meals cost a lot more than home-cooked meals. Of course, the difference in cost becomes greater the more people you have in your family. By simply cooking more meals at home, you can cut back on unhealthy food additives like salt, fat, and sugar, while saving money in the process. Eating a poor diet can also contribute to weight gain, causing you to become overweight or obese. Being overweight or obese comes with more negative consequences than just ill-fitting clothes. Namely, it can affect your life insurance rates or whether your life insurance application is approved or denied altogether. Underwriters use height/weight tables to evaluate your health rating. If you're overweight or obese, you could be offered higher life insurance rates than someone in a more healthy weight range, even with all other factors being equal. If your health rating is too low, you could even be denied life insurance from that provider. Learn More: How Much Life Insurance Do You Need? Having a proper diet, and making other healthy lifestyle choices, can increase longevity. People who live longer are able to take advantage of compound interest longer. As a result, their investments can grow more over time. Living to 90 instead of 80, for example, gives you 10 more years to accumulate wealth and pass on larger assets to your survivors. If you've been engaging in unhealthy behaviors but weren't aware of the financial repercussions, now's the time to make a change. The great thing about making lifestyle changes is that you can make them gradually and still see an effect. You don't have to jump into it all in one day, but making small changes bit by bit is still a step in the right direction. Not only will you improve your health and finances, but you could also improve the lives of people around you. Quitting smoking reduces the amount of second-hand smoke your loved ones experience. Making more meals at home teaches the other members in your family about healthy eating as well. Before you know it, you'll have padded your bank account and improved your whole family's health. The post The Financial Effects of Being Unhealthy appeared first on Five Cent Nickel. Should You Be a Full-Time Employee or a Freelancer?